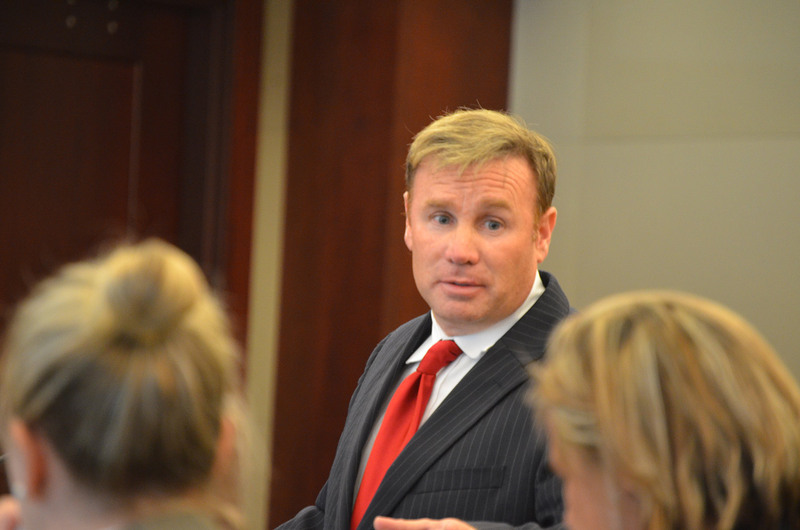 Note: this is an account of the Paul Miller trial’s afternoon session on Tuesday. For the account of the morning session, go here. 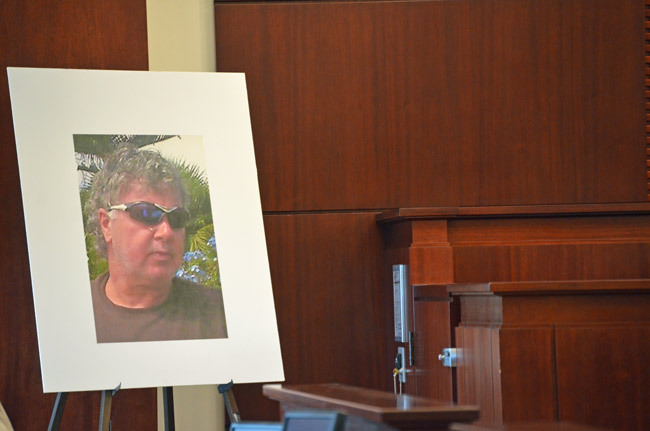 The first police officers at the scene of the shooting that claimed the life of Dana Mulhall on March 14, 2012, were Dennis Lashbrook and Robert MacDonald of the Flagler Beach Police Department. Miller, who had minutes earlier told a 911 operator that he had shot Mulhall—his next-door neighbor—was standing on his own property, looking toward Mulhall’s house, his hands in his pockets. Lashbrook and his partner saw Mulhall on his back, not moving, “bleeding heavily from his nose,” with a pool of blood by his head, which was a few feet from his front door. He’d soon be pronounced dead after efforts to revive him failed. He’d been struck by five bullets. Miller told Lashbrook where the gun was: on top of a curio cabinet, in a rectangular white box the gun had apparently been mailed in. Lashbrook secured it in the trunk of his cruiser. In a long series of questions illustrated by large-size photographs mounted on white boards and other evidence, including the box containing the 9 mm Lugar used in the shooting and a bag of ammunition, Assistant State Attorney Jacquelyn Roys Tuesday afternoon reconstructed the scene police and paramedics found that March evening on South Flagler Avenue in Flagler Beach. Roys and her co-prosecutor, Assistant State Attorney Kayla Hathaway, had two goals in the afternoon of the trial’s second day: to show how close to his front door Mulhall died as he was moving away from Miller, and to paint a portrait of Mulhall the man—including showing a portrait of Mulhall to the jury that mirrored the prosecution’s portrait: the beefy, sun-burned, easy-going “creature of habit” who worked hard mowing lawns most days, then kicked back, drank his Miller Lites, bought his lottery tickets and hung out with friends most afternoons, usually getting home in early evening and staying there. Miller’s defense team hung back most of the day, asking few questions of the prosecution’s witnesses, and doing so mostly to sow doubt about Mulhall’s nature and drinking habits in hopes of showing him to be more immoderate than witnesses were making him out to be. Twice defense attorney Carine Jarosz asked witnesses if they remembered what was imprinted was on Mulhall’s shirt, suggesting that the message may have diluted his moderate image. But neither witness could remember (Bissonette, described the shirt as “too bloody”), and Jarosz did not reveal the detail. The reconstruction of the crime scene principally featured the testimonies of Lashbrook and Jacob Bissonette, then a Flagler Beach paramedic who tended to Mulhall, and who wedged him out of a set of bushes where he’d initially crawled or fallen, to more easily work on him along with other paramedics. Two markings near Mulhall’s door showed where bullets were recovered. The questions focused on details: where medical equipment was positioned, where a sanitary glove had been left, where in relation to the front door Mulhall’s body was found. Jarosz’s most pointed questions to Lashbrook were about Miller’s demeanor with police. “He essentially complied with either all of your questions or request?” she asked the officer, who said yes. The defense’s claim is that Miller was acting in self-defense. Its strategy may focus on trying to make Miller as sympathetic as possible. He looks the part: his lanky, slightly bent-over grandfatherly demeanor lends him a benevolent air anyone crossing him in the street would be hard-pressed to associate with the look of a threatening shooter. Perhaps to unsettle the defense’s strategy, the prosecution made a point of de-sympathizing Miller after a 15-minute break in mid-afternoon. Before the jury was ushered back into the court room, Roys told Circuit Court Judge J. David Walsh, who is presiding over the trial, that while in the hall during the break, Miller had been seen rubbing his wife’s back. Everybody was standing in close quarters in that area: jurors, witnesses, Miller and his family. Roys described it as a “potentially dangerous situation for a trial, a mistrial,” and found the show of affection “inappropriate” if it were to occur in front of the jury, as it could prejudice juror’s perceptions of Miller. “I would ask that he refrain from patting his family members,” Roys said. Doug Williams, the lead defense attorney, asked the judge if he should ask his client to refrain from hugging his wife in the presence of the jury. He had not necessarily meant the question as anything but a straight-forward query. Roys didn’t see it that way, and said she didn’t want the issue to be made light of. “I’m not objecting to that, I think it’s a little bit tough, but I’m not objecting to that,” Williams then specified. The trial then resumed. 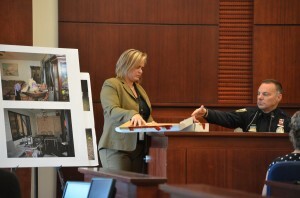 It was a quick but telling example of the heavy choreography, positioning and balancing acts that take place during a trial, when either side looks for any possible advantage to press or exploit, while the judge hopes to avoid the slightest possibility of a mistrial. When the trial resumed at 3:21 p.m., the prosecution devoted the rest of the afternoon to its portrait of Mulhall through his friends, including Brian Carr, a close friend with whom he’d fished the day before the shooting—and gotten sunburnt, according to Carr, while not catching a single fish—, his friend Richard Dwyer, and Nicolette Sanzone, one of his long-time bartenders, at Poor Walt’s in Flagler Beach. Mulhall had gone to lunch with Dwyer and others at 2:30 the day of the shooting, had two beers—according to Dwyer—at Johnny D’s—and two or three more with Dwyer at the Golden Lion, after which the friends split off. Sanzone saw him at Poor Walt’s that early evening, remembering that he had two beers in the bar he frequented almost daily at happy hour. He was then spotted by Summer Hodgin, the then-17-year-old daughter of his closest friend, at a convenience store where he bought his lottery tickets. That was within the hour when he got killed. But the defense attorneys almost as persistently asked each witness whether they knew if, outside of the time they saw Mulhall, they could know whether he’d been drinking. They could also only say no: just as the prosecution was trying to show that Mulhall was not drunk, the defense was sowing doubt about how much he’d been drinking that day, a detail relevant to Miller’s characterization to police after the shooting, when Miller claimed Mulhall was drunk during the confrontation. At one point one of the defense attorneys alluded to Mulhall’s blood-alcohol content, a detail that had not been introduced as evidence yet. The prosecution quickly objected. That detail was never revisited Tuesday. The defense had asked so few questions that the prosecution ran out of its scheduled witnesses at around 4 o’clock, an hour early. The trial was recessed until Wednesday. The prosecution isn’t done. But the prosecution’s case is set to end around midday Wednesday. It’ll then be up to the defense which, on Tuesday morning, had chosen not to present its opening arguments after the prosecution did. Those arguments, if presented Wednesday, will reveal a defense strategy that so far remains elusive, very possibly by design: the defense has nothing to prove. Only to undermine the prosecution’s case with reasonable doubt. Did he not admit to the police that he shot Mulhall? Did he not shoot Mulhall FIVE TIMES???? Several of which were in the back as he was crawling away? Mr. Miller…..one shot is self defense! Maybe a second. But five shots including shooting the man, who you claim to be stumbling drunk, in the back……..I am sorry sir, but that is murder!!! You admitted to the police you shot the man, and killed him. You provided them with the location of the murder weapon, which you so calmly PUT AWAY IN A BOX ONTOP OF YOUR CHINA CABINET after firing five rounds into a human being……and I pray they put you in a cage for as long as the law will allow! I just find it a shame that they retired Ol’ Sparky, because you would have been the poster child for a sentence of death by electrocution! That is why we have trials – so that the true facts can come out not the perceptions of those only reading news accounts. And for those who hate lawyers maybe a reading of the Constitution is in order. Death Row inmates have a choice of executions. Either lethal injection or electrocution. Dana is a dear friend to our family members… He is a great man.. We have heard all of this and it really sickens me that Mr. Miller is claiming self defense… There was no reason for him to feel he needed to defend his self with a Gun… Dana was in his own yard, separated by a fence. Mr. Miller had many options other than taking a life that day. He first had the option of bringing his dogs in the house. He had the option of letting the dogs stay out and bark, and him go in the house. He had the option to just ignore the complaints coming from across the fence. He had the option take his dogs for a little walk/ride. He had the option to call the police on his “Drunk” “beligerant” neighbor who was yelling at him. He had many options. The option he chose was to go into his house, grab a gun and go out onto his porch and wait. Wait for Dana to come back out of his own home. When he did Mr. Miller chose to reignite the argument, and he chose to continue the confrontation. In the end, He fired not once. twice, but 5 shots at Dana who was walking/running away from him.. We all know that it is virtually impossible to stop a dog from barking & people, neighbors ect.. can get aggravated by the constant barking of dogs but to take the life of another human being over a complaint of a barking dog is uncalled for.. We pray for peace love and Justice for Dana;s Parent’s family & friends.. as it has been stated there will never be closure We pray for Justice For Dana & his Family!! I hate Lawyers just as much as I hate DRUNKS !!! But Leutenant Daaan, don’t worry. You lose all your hate by the end of the movie. This article reports an FBI agent shot a man for being violent and threatening. There is no mention of a weapon on the assailant. This seems similar to both current Florida stand your ground cases now under review. I am still waiting to see more facts in the Miller case before I have any opinion. We are very saddened by the loss of Dana. He is a dear friend of our family members. We all know this is not a self defense case.. as it has been said before Mr. Miller had many many options that day.. He had the option to call the police on his “Drunk” beligerant neighbor.. he had the option to bring his dogs inside.. take them for a walk/car ride.. but what did he decide to do?? Walk into his home.. grab his pistol.. and wait for Dana to come back outside then proceeded to shoot him not once , twice but 5 times as he was walking away… Mr. Miller had plenty of time to think of his actions… we all know that it is virtually impossible to stop a dog from barking but for the owner of the dog to take it this far is beyond words… I pray for peace love through this time for Dana’s family & friends.. There is a device, sold at most pet stores, I believe it’s called “the egg”. We paid $40 for one at Pet Smart. It sends out a high pitched, uncomfortable sound (that only dogs can hear), when they start barking. Dogs quickly equate their barking with the sound, and they stop. The best news is that it works even many feet away. We use it when our neighbor’s dogs start barking. . . works like a charm! By the way, our local police take barking dogs much more seriously since this incident. We were forced to call them before we found this technological miracle. Imagine. . . such a terrible tragedy could have been completely avoided for $40!